Dear Pupils, Parents and Visitors. 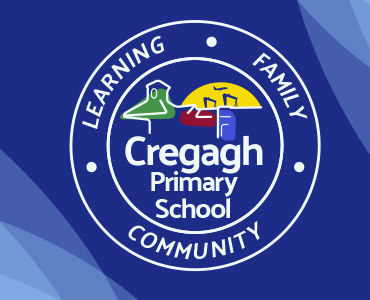 I am delighted to welcome you to Cregagh Primary School’s website; which I hope will provide you with a ‘window’ into school life at Cregagh Primary – a school that truly puts children first. Our school is a caring, friendly, family-based school were every member of staff works to provide the best educational experience and pastoral care for each child. Our school motto, “Together, we make a difference” reflects the importance we place on working together in partnership with whole families and our local community. Cregagh Primary School is very special to me; it’s very much part of my DNA! As a former pupil of the school myself, I am intensely proud of our school, our community and particularly our pupils. I look forward to our learning journey together: children, parents and school. Thank you for your continued support of our school and I hope you enjoy exploring our website. The War is over...VE Day celebrations in P4. 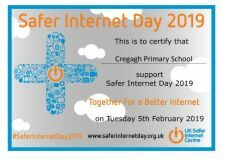 Tuesday 5th February, Cregagh Primary School will be taking part in Safer Internet Day 2019. We will be joining thousands of schools and organisations across the UK to help inspire a national conversation about using technology responsibly, respectfully, critically and creatively. Over the week, we will be focussing on lots of ideas to help the boys and girls stay safe online. We will also be sending out tips and ideas to give parents and carers advice on how to keep children safe online. Have a look through our Internet Safety section in the Parents tab for more information.